We offer laparoscopic distal pancreatectomy for endocrine and cystic tumors of the body and tail pancreas. Endocrine and cystic tumors of the pancreas are associated with an excellent outcome and are often benign or associated with a very low grade malignancy. During this procedure two half inch incisions are made and a hand-access device is utilized to perform the surgery. The hand-access device incision is about 2.5 to 3 inches long. The hand-access devices are a major advancement in laparoscopic surgery and allow the surgeon to place his/her hand into the abdomen during the surgical procedure. Patient who undergo laparoscopic distal pancreatectomy have less pain, rapid recovery and early discharge from the hospital compared to open distal pancreatectomy. Our average hospital stay for this procedure is about two days. Benefits of minimally invasive or laparoscopic procedures include less post operative discomfort since the incisions are much smaller, quicker recovery times, shorter hospital stays, earlier return to full activities and much smaller scars. Furthermore, there may be less internal scarring when the procedures are performed in a minimally invasive fashion compared to standard open surgery. 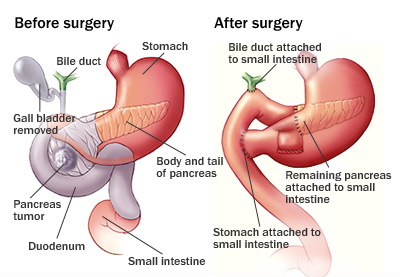 Searching for best Pancreas Surgery in Ahmedabad or Nearby Areas? Subhadra Hospital is experienced Pancreas Surgery specialist doctor hospital which is located at Paldi, Ahmedabad, Gujarat, India. Who offers affordable Pancreas Surgery treatment services in Gandhinagar, Kalol, Mehsana, Patan, Junagadh, Surendranagar, Jamnagar, Bhavnagar, Kheda, Valsad, and Gujarat? Find the affordable Pancreas Surgery surgeon in kutch, vapi, Anand, Amreli, Petlad, Navsari, Rajasthan, Jaipur, Udaipur, Jodhpur, Ajmer, Kota, Kalol, Bhuj, Morbi, Gujarat. Subhadra Gastro Hospital in Ahmedabad is a union of the best medical minds and the latest technology backed by an excellent infrastructure to deliver superior medical care and treatment to its patients..